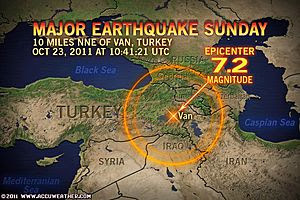 – Several Aftershocks have occured following initial quake, two have been as strong as 5.6 magnitude. Heavy bands of rain have focused on Ireland and N. Ireland over recent days and they continue to do so for the next 24 hours before a slow eastward progression of the near stalled front starts to shift east bringing the heavy line of rain across the UK. On the southern end of the same cold front bringing the intense, persistent rains to Eire is making it’s way into Spain and looks likely to present areas with flooding, even flash flooding in the next few days. Models show some exceptionally heavy burst of rain to come. As the rains intensify over Sain and they move east away from Ireland and into England and Wales, the warmth and sunshine builds over Norwary, Sweden and even Denmark. Highs by midweek may be some 8 to 12C above normal. 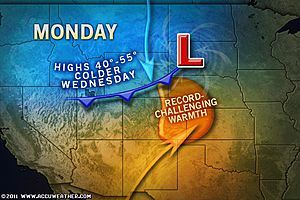 While Monday may provide Denver, Colorado with near record highs of near 80 degrees, this heat will rapidly dissappear by Tuesday and Wednesday as a powerful cold front sweeps down from Canada replacing the warm, sunshine with heavy snow and freezing winds. We will see huge temperature plunges of between 45-55 degrees in a matter of hours throughout the Northern & Central Rockies. Highs by midweek will be near freezing for Denver and by Wednesday night, they may plunge into the mid-teens with harsh windchills and several inches of snow on the ground. Thunderstorms roll across Southern Manitoba last night! Though not unheard of, the storms that rolled through Winnipeg and surrounding areas, caused by a cold front which enhanced atmospheric lift are relatively infrequent by late October as cool air is normally becoming better established. Interestingly, northern Manitoba is seeing some light snow and rain/snow mixes. Typical for this time of year. TODAY’S POST WILL BE UPDATED THROUGHOUT TODAY WITH NEW STORIES, PHOTOS AND VIDEO, STAY TUNED!